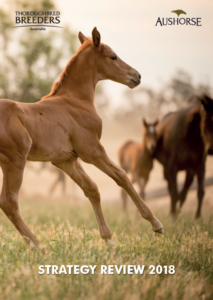 As we edge closer to the completion of the yearling sales and start contemplating the 2018 breeding season, I would like to point you to Thoroughbred Breeders Australia (TBA) and Aushorse’s recently released report titled Strategy Review 2018. This report outlines key initiatives undertaken in 2017 and looks at major issues we are trying to resolve in 2018. We have made significant gains with the Federal Government in 2017. These have included the introduction of the new thoroughbred industry matched levy, making up to $1 million available for research in the thoroughbred industry each year; as well as a recent decision to enhance thoroughbred industry access to 457 and related visas. In 2018, we have a strong focus on the issue of staff and skills shortages in our industry and finding ways to resolve these shortages particularly through the national TAFE sector. Please do not hesitate to get in touch with me or a member of the TBA or Aushorse team if you would like to discuss any aspect of what we do on behalf of the industry.